As one of North Alabama’s most experienced clinical waste disposal companies, we know what it’s like. We understand that ensuring your practice's compliancy is time consuming enough. Add to that the managing of day-to-day operations and juggling HR and customer issues, all while purchasing supplies and equipment, makes for a hectic day. As a clinic administrator or office manager you know, of course, how important proper disposal of medical waste is. But if you and/or the staff you oversee don’t follow proper medical waste disposal procedures, there could be serious consequences. Most staff members want to do the right thing and usually are good about properly disposing medical waste. But there are times—like when regulations change or a new member is brought on board—that compliance falls through the cracks. One of the best ways to ensure timely compliance is through online training solutions that help you avoid fines while keeping your employees safe. Typical online courses can cover everything from waste handling and classification regulations to pharmaceutical waste identification. And online training not only keeps your staff up-to-date on the latest compliance requirements, it also frees you to handle other important administration duties. In the United States, 13 pounds per person of medical waste is produced each year! Without proper disposal, the hazardous materials can spread disease and have an impact on water supplies and wildlife. Improper disposal can also harm your medical facility's reputation. Risks to staff including exposure to hepatitis, HIV, and other communicable diseases. Risks to the community from leaching waste into the air, land, and water. 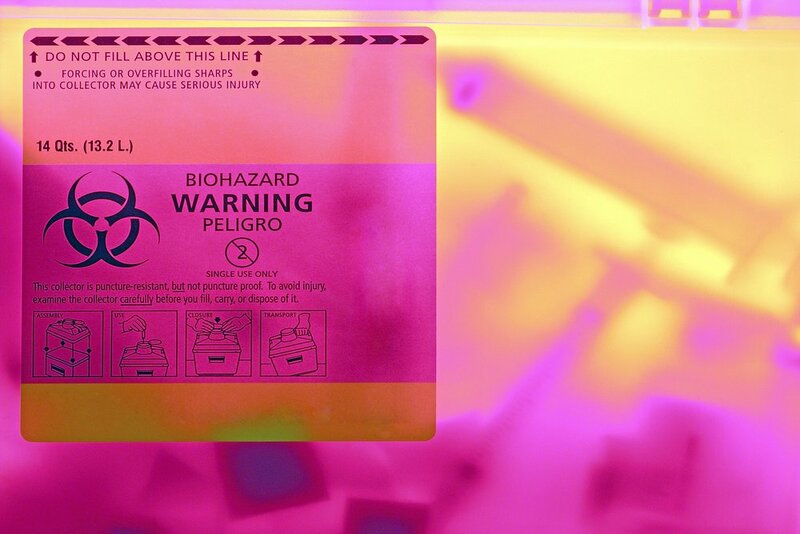 Many medical wastes have an extremely long half-life and aren't going to just wash away. Water supply contamination, a serious consequence that cannot be handled or eliminated through traditional water purifying means. Negative effects on wildlife populations from toxins that enter the ecosystem toxicity. Both animals and humans can suffer birth defects, mutations, increased cancer risks, general health maladies, and face exposure to other potentially deadly diseases. Potential liability and risk of fines when generated medical waste isn't properly managed. Even what are considered relatively harmless forms of waste, such as ibuprofen, are now being studied to see their effect on crops including weakened root systems and stunted growth. Another less-discussed, but equally important, potential issue includes medical facility reputation. The CDC has warned that improper packaged and disposed of medical waste could put our nation at significant risk. And there’s no doubt that a reputation for unethical or substandard medical waste disposal can have a huge impact on how the public views a medical facility. Regulated medical waste disposal plays a valuable role in keeping societies and the environment at large safe. Knowing how to properly package waste for disposal—and training staff how to comply consistently and correctly with local and federal regulations—is an important part of your job. A reputable, experienced medical hazardous waste disposal company is crucial in helping you properly address the packaging of all types of waste in a safe, comprehensive, and professional manner. Is large enough to handle all your hazardous waste disposal needs while providing the personal, caring service you deserve. Has a proven reputation in the industry. Is helpful to everyone on your staff in guiding adherence to compliance regulations. To help you align your healthcare facility with medical waste disposal best practices, download our medical waste guidelines eBook today. Use it to understand how your facility compares to standard best practices for medical waste disposal and to verify that you're meeting the latest compliancy rules and regulations.